Hopewell Culture, an archaeological designation, derives its name from the Hopewell site, one of many ancient earthwork complexes in the Scioto River drainage of south central Ohio. Hopewell Mound Group, part of the Hopewell Culture National Historical Park, is located along the North Fork of Paint Creek, several miles west of the concentration of earthworks on the Scioto River around Chillicothe. 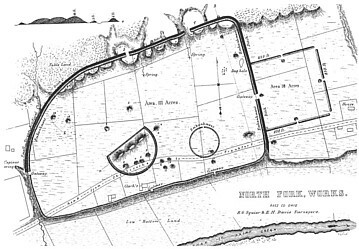 Hopewell Earthworks is vast, truly significant in size, enclosing over 100 acres with miles of earthworks. 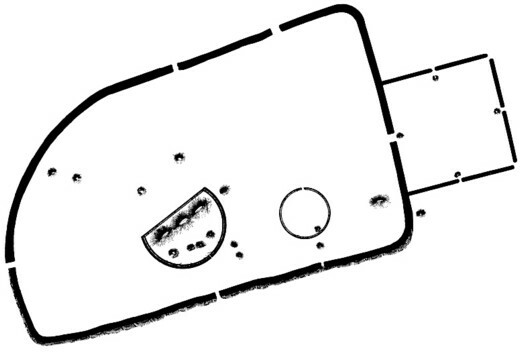 While the large enclosure lacks the symmetry of other Hopewell earthworks, the attached square, inner circle and partial circle present geometric forms. In 1820, Caleb Atwater surveyed part of the works and produced the first map. 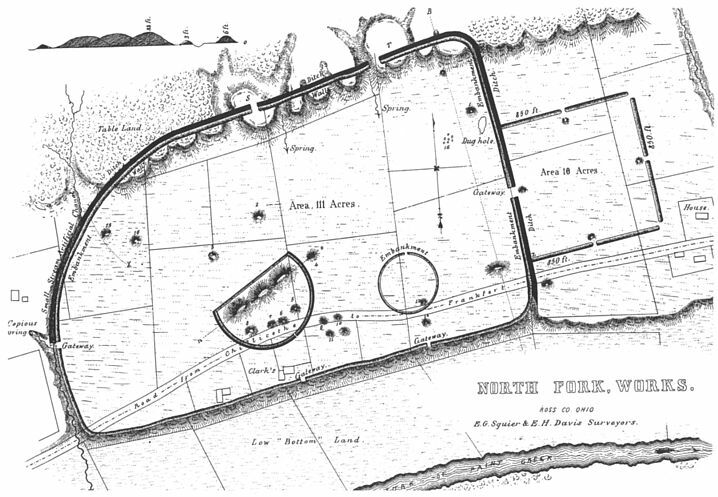 Squier and Davis conducted an intensive survey of the earthworks in 1845, including Squier and Davis the first documented excavations. A 1891 excavation was led by Warren K. Moorehead, who renamed the site after landowner Mordecai C. Hopewell. Download the Placemarks file with overlay maps, hopewell.kmz. Moorehead began excavations to find artifacts for the World's Columbian Exposition, after not finding sufficient artifacts at Fort Ancient. Moorehead focused on the mounds, excavated many mounds, and produced another map of the earthworks. More than 50 burials with burial goods were found within Mound 23, the three large, cojoined mounds. As a result of attention to these disturbed cultural remains, today a portion of the Ohio Valley cultural sequence is named "Hopewell Culture." This archaeological entity corresponds to the epoch when the major geometric earthworks were completed by people in the Middle Ohio Valley, ranging from about 100 BCE to 500 CE. Henry Shetrone of the Ohio Historical Society conducted excavations from 1922 to 1925, whereafter nearly every mound was excavated once, if not several times. Mark Seeman directed a survey within the earthworks and in the vicinity in 1980. In 1996, William Dancey conducted shovel tests at 21 locales in the vicinity of the earthworks. Others, and particularly Hopewell Culture National Historical Park archeologists since 1998, have also conducted fieldwork. Some Hopewell earthwork sites have obsidian artifacts, the majority, several hundred pounds, was found in one mound at Hopewell Mound Group. Some was sourced to the Yellowstone area in Wyoming. Mound City to Hopewell Mound arc distance equals 0.00020 circumference (CIR/5,000). Atwater, C. 1820 Descriptions of the Antiquities Discovered in the State of Ohio and Other Western States. Archaeologia Americana 1:105-267. Dancey, William S. 1996 Hopewell Earthwork Catchment Survey: Interim Report. Report submitted to the National Park Service, Hopewell Culture National Historical Park, Chillicothe, Ohio. Lepper, Brad 2006 Ancient DNA from the Ohio Hopewell Ohio Archaeology Blog, June 22, 2006. Moorehead, W. K. 1922 The Hopewell Mound Group in Ohio. Field Museum of Natural History, Anthropological Series , Publication Number 211, Volume 6, No. 5, pp. 73-181. Pederson, Jennifer, Jarrod Burks and William Dancey Hopewell Mound Group: Data Collection in 2001. Seeman, Mark F. 1981 An Archaeological Survey of the Hopewell Site (33Ro27) and Vicinity, Ross County, Ohio. Report submitted to the Ohio Historic Preservation Office. 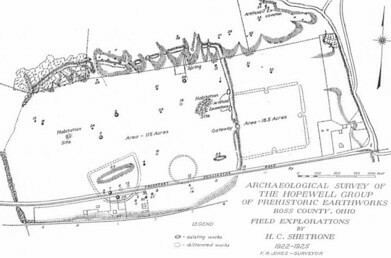 Shetrone, H. C. 1926 Exploration of the Hopewell Group of Prehistoric Earthworks. Ohio Archaeological and Historical Publications 35:1-227. The Hopewell site has been purchased by the National Park Service, is now managed as part of Hopewell Culture National Historic Park, and is under study and development for interpretation. More information and some excellent readings on the Hopewell Culture are found at the NPS site.